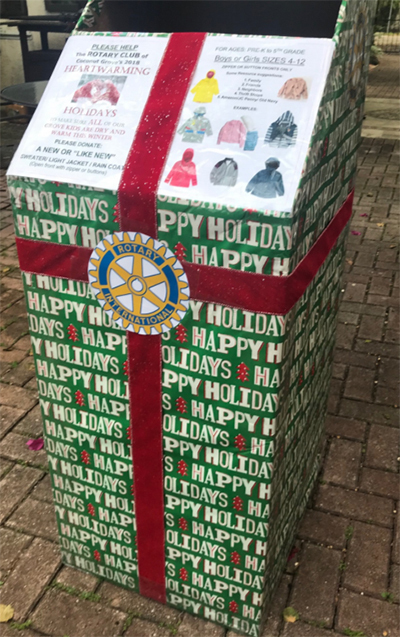 The Rotary Club of Coconut Grove has announced its year-end program, Heartwarming Holidays, a clothing drive to collect new or “like new” sweaters, jackets and raincoats for pre-K to 5th grade Grove children in need. “As winter approaches, we want to make sure that all the children in our community will stay warm and dry,” says Rotarian Kathy Kesler who started the initiative. Rotary has placed collection boxes at key locations in the Grove including Milam’s Market, Coconut Grove Laundry and Dry Cleaners, the Coconut Grove Post Office, Berries in the Grove, and Adventure Sports. In addition, a collection box is at the City of Miami Riverside Center, 444 SW 2nd Avenue. YOU MAY NOT LIFT THE PHOTOS & TEXT. IT'S COPYRIGHTED INTELLECTUAL PROPERTY. YOU CAN HOWEVER SHARE A STORY ON SOCIAL MEDIA BY USING THE LINKS HERE. For linking to this one story, just click on the time it was posted & just this story will open for sharing - only through social media. Not copying and pasting. Place your Quick Link ad here. © All content in the Coconut Grove Grapevine is copyrighted by law. This means text, photos, ads and all images. NO CONTENT may be picked up and used in full or part in full or altered. This especially is true of photos and graphics. No photo or image may be picked up, morphed and reused. If content is used on-line, ONLY an actual clickable link must go back to the source on the Grapevine and the images and text may not be copied and used in any way, shape or form. We will prosecute to the fullest extent of the law for any violations. NOTE: the Copyright Law required a copyright notice to protect works until 1977. In 1978, however, the law changed and abolished the requirement for copyright notice. This means that every published work (be it on paper or digital media) automatically gets copyright protection, whether expressed with a notice or not. The Coconut Grove Grapevine is protected under the section 230 of the Communications Decency Act, this protects us from what others say in the comments section and it also gives us legal reason to sue those who cyber stalk and harass us on a continual basis.